Can dogs eat applesauce? Yes they can, but we have said this many times before with human foods, you feed your dog applesauce, the sensible thing is to do it in moderation. So don’t be scooping that sauce into your dogs bowl like its Christmas. Applesauce contains a lot of sugar, and some dogs are prone to diabetes – not a good mix. However, in small amounts your dog will benefit from a little applesauce now and then. Most dogs like the sweet taste of applesauce – apples contain vitamins C and K, fiber and calcium, all of which are good for your dog. Straight apples can be dangerous for your dog to eat. Apple seeds, stems and leaves contain cyanide. That’s just as bad as it sounds, and is very toxic to dogs. Fortunately, we’re discussing applesauce here where all such ingredients have been removed. Applesauce is therefore safe for your dog to eat. 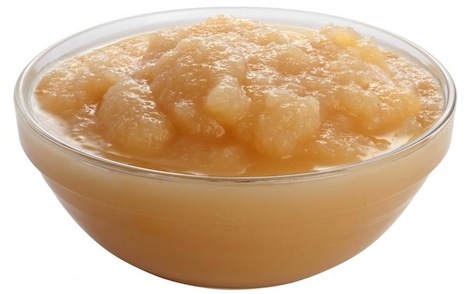 Some applesauce may contain coloring, pesticides or preservatives. These are not good for your dog to consume. If you want to feed your dog applesauce, why not look for the organic, sugar free versions. These are far better for your dog to eat. Fruits and vegetables prepared for human consumption can sometimes be problematic for our pets as it can lead to diarrhea. This is why the “in moderation” mantra is so important. By feeding your dog just small amounts of applesauce you should have no problems. 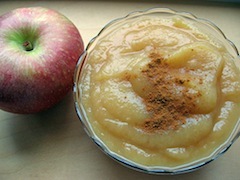 On the subject of moderation, applesauce is best given as a treat rather than part of a meal. All in all applesauce should not make up anything more than 5% of your dog’s dietary intake. It is suggested that applesauce should be avoided with puppies. A young pup can suffer from severe dehydration if they were to get diarrhea from eating applesauce. Applesauce can be given to your dog in various ways. As we have stated, the best way a dog can eat applesauce is as a treat. Feed no more than a teaspoon to your dog, either by placing a small amount in his bowl, or allowing him to lick some from the tip of your finger. You should never feed a dog anything directly from the spoon, not only is it unhygienic if the spoon ends up back in the dishwasher, your dog could end up swallowing the entire spoon in it’s rash attempt to gulp down its treat. A popular method of getting your dog to eat applesauce is to freeze some in an ice cube tray to make sweet little applesauce popsicles. Your dog will simply love this treat, especially on a hot day. Applesauce is a very simple treat that you can make for your dog. All you need is a few apples and about 30 minutes of free time. Completely peel some organic apples, stick them in a bowl of water boil for around 15-20 minutes, strain and then mash. Allow to cool and either feed straight away, or place into the ice-cub tray for delicious little applesauce treats for your pooch. For an interesting article on the signs of diabetes in dogs, head here. For the details of the nutritional value of applesauce, head here. PetMD article on diabetes in dogs. Can dogs eat applesauce? If you have any comments on your own experiences with feeding your dog applesauce please leave them below.